Have you seen the largest gold coin in the world? Following Gold Coin is claimed to have 100kg in weigh and minted by Royal Canadian Mint with maple leaves on one side of the coin and Queen Elizabeth II and 1 Million Dollars text on the other side. 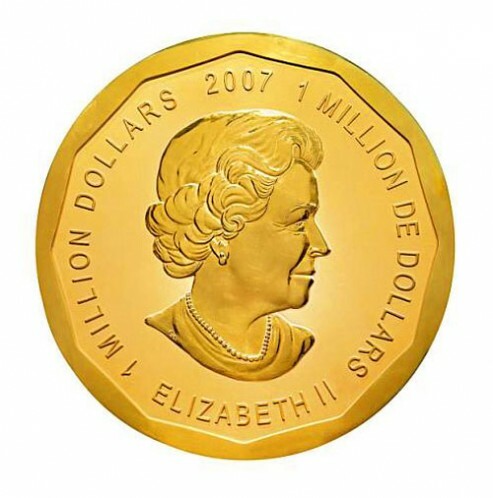 The coin itself was made in 2007 and the price has fetched USD4million dollars or EUR3,270,000 to be exact in Austria’s Dorotheum auction house. The gold purity is claimed to reached 99.99 percent, the purest ever produced gold coin in the market. The gold coin was being auction simply because the previous owner, Austrian investment firm – AvW Group, went bankrupt. And surprisingly, the auction value has significantly surpassed from the face value of one million dollars in the recent years due to high prices of gold. Since 2003, thumbmonkey have been selling both new and pre-owned video games, video game consoles, and video game accessories at some seriously low prices.